ONE 17.5 CM STRAND OF REALLY LOVELY NATURAL SMALL PERIDOT FLAT RECTANGLE BEADS. BEADS ARE HAND CUT AND THEREFORE THERE IS SLIGHT VARIATION IN SIZE BETWEEN BEADS ON A STRAND. THICKNESS: 2 MM. ONE 16.5 CM STRAND OF REALLY LOVELY NATURAL PERIDOT SMOOTH BUTTON / RONDELLE BEADS. 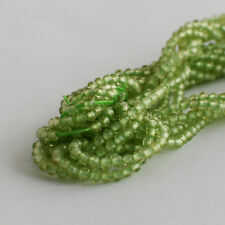 HALF STRAND (17.5 CM) OF REALLY LOVELY NATURAL PERIDOT TINY ROUND BEADS. Unlike round beads where it is a simple matter of putting the rough material into a machine, pressing a button and waiting for the process to be completed, each and every one of these beads has been made by hand. High quality natural Peridot semi-precious gemstone faceted round beads. Size: approx2mm. 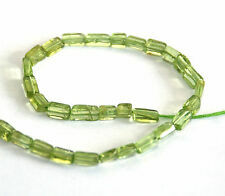 ONE 16.5 CM STRAND OF REALLY LOVELY NATURAL PERIDOT FACETED RONDELLE BEADS. Natural Prehnite Faceted BeadsLoose / Temporary Strand. Size of Beads : Graduated 6mm -12mm. Colour of Beads : Light Green. Inclusion in Beads : Included (Visible Inclusions). 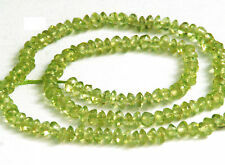 HALF STRAND (16.5 CM) OF REALLY LOVELY NATURAL PERIDOT TINY ROUND BEADS. Semi precious gemstone Peridot chip beads. For sale - a 20 gram bag of Peridot, semi precious gemstone nugget / tumble chip beads. Heat treated to illiminate impurities so light green in colour. My pictures are not always of a competition winning standard, but I’m working on it! (Quantity - 150. Feel free to collect in person :). Important info. (Colour - Green. You will receive a random selection of beads, the photos are a guide of what you will get :). Quantity - 150. 20X 10X 15X 25X LED Magnifier Double Eye Glasses Loupe Lens Jeweler Watch Repair. 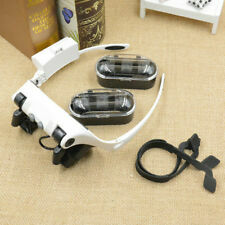 Product List: 1 x LED Magnifier，1x Head band，8x Lens. We'd like to settle any problem in a friendly manner. Colour: White. 20X 10X 15X 25X LED Magnifier Double Eye Glasses Loupe Lens Jeweler Watch Repair. 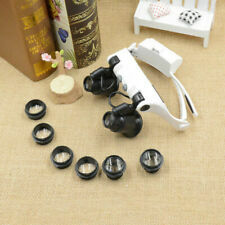 Product List: 1 x LED Magnifier，1x Head band，8x Lens. We want to make sure you are happy with our item. Goods without RMA number will NOT be accepted. Product List: 1 x LED Magnifier，1x Head band，8x Lens. We want to make sure you are happy with our item. Goods without RMA number will NOT be accepted. We'd like to settle any problem in a friendly manner.